The Widnes Wild Academy Under 15 team played their first ever competitive home league fixture at Planet Ice Widnes on Saturday, losing 0-14 to a highly organised and experienced Nottingham Under 15 side. This is the first season that the Wild Academy have entered teams into the league and it is quite a steep learning curve for players who have never played a competitive match before this September to come up against teams full of players who have already been playing together for some 6 or 7 years. However, what they lacked in experience and, indeed, numbers (the Nottingham side brought a full roster of 22 players, with 4 full lines to call on while the Wild Academy had 1 netminder and just 10 skaters) they certainly made up for with enthusiasm and the Wild players battled hard and tried to play positive hockey throughout the game. The full Wild U15 line up was: Luke Mullarkey, Finlay Wood, Rory Sillery, Reid Ryan, Alain Barthelemy, Jamie Lee Houghton, Joel Bark, Adam Vigh-Yecsey, Jack Davies, Callum Thompson (nm) & Jake Meehan. The Wild Under 15 team are next in action on Saturday 17th November when they play the Deeside Dragons under 15 team at Planet Ice Widnes. Before that, the Wild Under 13 team play their first ever competitive home game this Saturday 10th November when they play the Blackburn Under 13 team at Planet Ice Widnes. The game faces off at 6.50pm and admission is free. 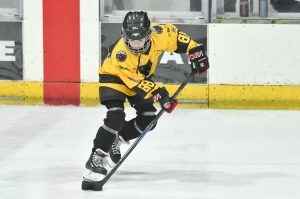 This season is the first that the Widnes Wild Academy have entered the competitive EIHA leagues and have teams at Under 9 and Under 13 and Under 15 level. Planet Ice Widnes has a very well-organised and structured “learn to play ice hockey” scheme in place and are always keen to attract new players of all age groups – boys and girls. Anybody interested in joining the Wild Academy should contact the rink on 0151 420 7930 and speak to the Junior Development Officer and Academy Manager Mikey Gilbert.